How far would you go to get into a football game? 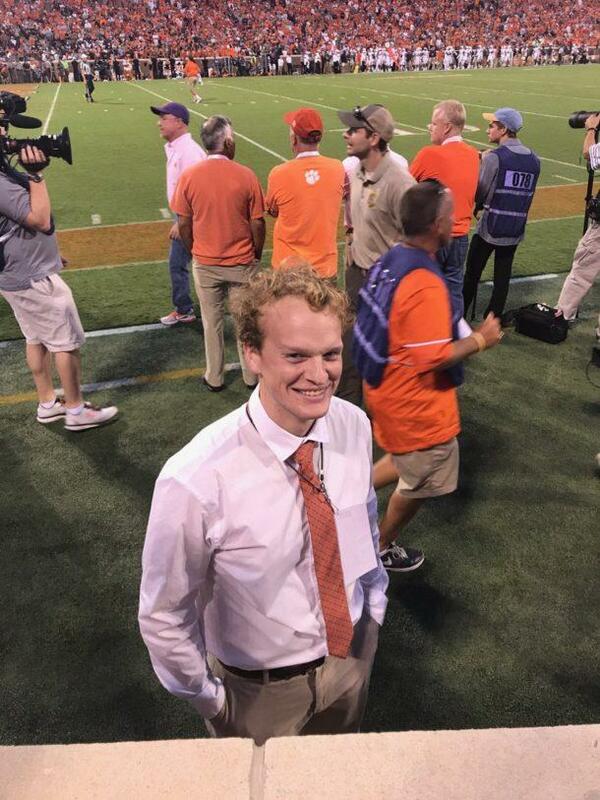 We all know someone who has borrowed a student ID, attempted to scale the fences, or used a Wendy's gift card as identification to make it into a stadium, but this Clemson student took it one step further: he made a fake ESPN employee ID and it actually worked. 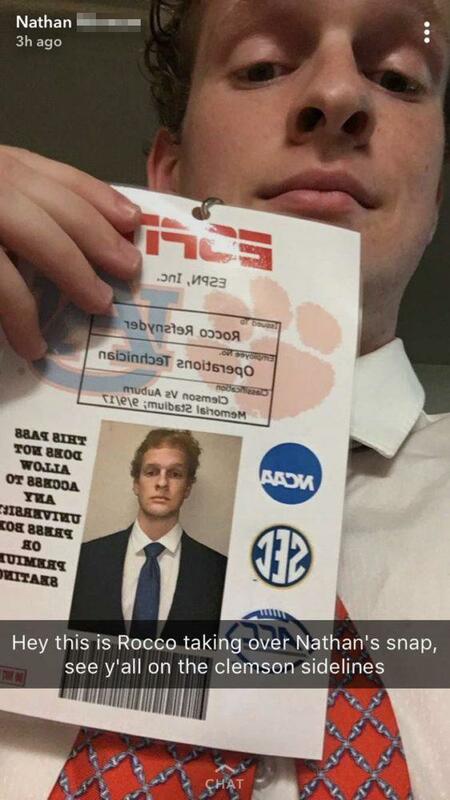 Nathan, a junior studying Economics at Clemson, created a fake identity and badge to match in order to watch the game against Auburn from the Clemson sidelines. "Hey this is Roco taking over Nathan's snap, see y'all on the Clemson sidelines," read a snapchat from Nathan's account on game day. In a tweet that has since been deleted, Dane Szalwinski, a friend of Nathan's, shared a series of images that told the story of one game day hero. Nathan, using the false name "Rocco Refsnyder", was able to fool security and make it onto the field as an "Operations Technician" for ESPN. According to a text sent to Dane, Nathan was unable to acquire any tickets to the Clemson game on his own, so he took to PhotoShop in order to solve his dilemma. 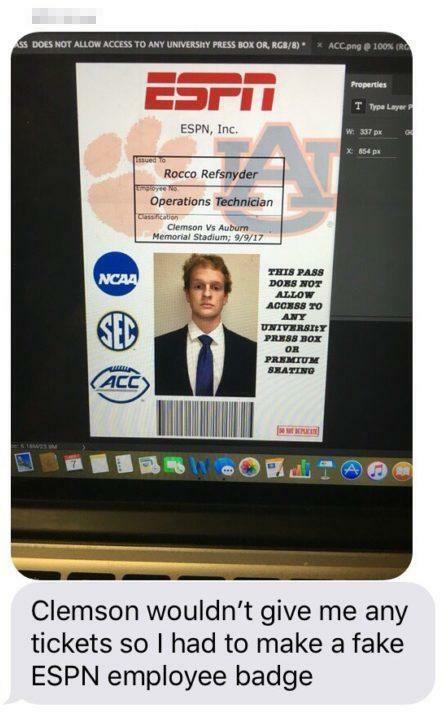 "Clemson wouldn't give me any tickets so I had to make a fake ESPN employee badge," the text reads. Rocco Refsnyder might not be a real ESPN employee, but he's a real inspiration to all the die hard college football fans out there. Clemson defeated Auburn this weekend 14-6, and with a little jerry-rigging and a lot of balls, Nathan was there to see it happen in person. Nathan declined our request for interview.